A Reverse Mortgage may be right for you! A Reverse Mortgage is a unique loan program that enables homeowners age 62 and older to access the equity in their home without creating a monthly payment. Many senior’s homes have appreciated in value over the years while their incomes have failed to keep up with the rising costs of living. A reverse mortgage enables you to improve your monthly cash flow by tapping into the equity in your home. Because the money you receive from a reverse mortgage is tax free, it will not affect your Social Security or Medicare benefits. Best of all, you will live in and retain ownership of your home without making another mortgage payment for as long as you live there. The federal government through the Federal Housing Administration (FHA) insures the reverse mortgage program. *All Reverse Mortgage lenders calculate your available equity based on age, house value and current interest rates. The amount of funds you receive is the same no matter which lender you use. So why not choose Lyn Graham to help you find your lender. The personal service I provide is my commitment to serving seniors in Maryland, Virginia, and Pennsylvania. Contact Lyn to answer your questions. A reverse mortgage is a federally-insured program with no income or credit requirements that allow a homeowner of at least 62 years of age to access the equity of their home without having to make a mortgage payment. What is a Reverse Mortgage? A reverse mortgage is a federally insured program with no income or credit requirements that allows a homeowner of at least 62 years of age to access the equity in their home without having to make a mortgage payment. Will they take my home? NO. The house remains in your name and the lender is only repaid the loan balance or home value, never more than what the house is worth. If there are no payments, what are my responsibilities as a borrower with a reverse mortgage? You are required to pay your property taxes, keep current the property insurance, maintain the home and notify the lender if you will be away from the property for an extended period of time. How safe is a Reverse Mortgage? FHA, HECM and Fannie Mae Home Keeper reverse mortgages are very safe! HUD/FHA and Fannie Mae guarantee that the payments are made to you and you stay in your home as long as you like and that you and your heirs will never owe more than your home’s net worth. Can a Reverse Mortgage be taken out if I have a current mortgage on my home? Yes. The existing mortgages will be paid off at closing. The proceeds from the reverse mortgage pay the remaining mortgage balance. What are the fees associated with a Reverse Mortgage? First, most fees connected with a reverse mortgage loan can be included in your loan balance, your out of pocket costs are normally zero. The types of fees included are the origination fee, appraisal, credit report, title examination, binder/insurance, flood certification, city/county/state recordation taxes, court recording fees, reverse mortgage legal document preparation fee and a settlement fee to the closing agency or attorney. In addition, HUD/FHA charges a 2% mortgage insurance premium on the HECM loan. The fee schedule of the closing costs should be provided to you in a detailed fee worksheet when you initially request information about a reverse mortgage and also at the time of application. The only fee that may be collected in cash from you at the time of service is $350-$450 to pay an FHA certified appraiser to prepare an appraisal report. This fee can be reimbursed to the borrower in cash out of the loan proceeds at settlement/closing. The fee cannot be reimbursed if you do not go to settlement/closing. When does the loan become due and payable? The loan is due and payable when the last remaining borrower sells the property, permanently leaves the home, or passes away. Until these events take place you live in the home and make no payments to the lender. What is due when the loan is repaid? The borrower will pay back the financed closing costs, the amount used to pay off any mortgage payment at the time of closing, any cash amounts received during the term of the loan plus accumulated interest. Will I ever owe more than my home is worth? The federal government guarantees protection to your heirs through the Mortgage Insurance Premium. All reverse mortgages are “non-recourse” loans, which means that the borrower can never owe more than the value of the home regardless of loan balance. If the Reverse Mortgage balance ever grows to exceed the value of the home when the last co-owner dies, sells or moves; then the difference is paid to the mortgage company by HUD/FHA or by Fannie Mae. The amount owed by you or your heirs is limited to the net sale value of your home. Neither you nor your heirs have any personal liability beyond the net sale value. Do I or my heirs have to sell the property to repay the loan? No, the Reverse Mortgage can be refinanced by a conventional mortgage loan, or your heirs may use other financial means for repayment (e.g. : life insurance proceeds or refinancing) and keep the home in the family, that is their choice. Your remaining assets are completely protected and cannot be touched, even if you have no equity remaining in the home when you die. Does the Mortgage Company take over Ownership of my Home? No! You retain ownership in your home. A lien is placed on your property and is recorded in the local county or city courthouse. This lien is the security for the reverse mortgage loan, but you retain ownership of your home. Your heirs must refinance this loan or they must dispose of the property and repay this debt when you die, sell or permanently move out of the property. What happens if one of the joint borrowers dies? The surviving borrower receives the same monthly income or access to the remaining funds in the line of credit. That borrower can continue to receive funds from the line of credit until those funds are exhausted. How will this affect my heirs and their inheritance? Depending on how long you participate in the reverse mortgage program, the home equity is preserved for your heirs to inherit. When the loan balance (consisting of funds received, plus the interest and fees added over time) is repaid, the remaining equity stays with our estate. How to the proceeds affect my taxes or public benefits? Taxes: Reverse Mortgages are the proceeds of a loan and are not taxed as income. Please consult your tax advisor regarding tax policies for your state, or local government. The interest accruing on the Reverse Mortgage loan cannot be deducted from your taxable income by IRS rules. 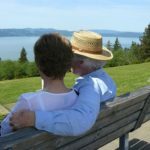 Social Security and Medicare: A Reverse Mortgage loan does not affect your rights of benefits under Social Security or Medicare. What about a home in a “living trust”? While the trust documents are subject to review, a homeowner whose home is in a living trust can usually take out a reverse mortgage. What happens if I want to sell my home or move? If you sell your home or permanently move out, the loan balance needs to be repaid. The program does not restrict your decision to sell your home. “Permanently move out” is defined very clearly in all of the Reverse Mortgage documents that you will sign at closing/settlement as “all borrowers are absent from the home for more than 12 consecutive months.” Therefore, when you do decide to sell or permanently move, you will be required to repay the reverse mortgage loan balance in full – or up to the net sale value of the home, if that is lower. If any equity remains in the home, then you will decide what you wish to do with that equity. You will never have to use other assets to repay your reverse mortgage loan. FHA will pay the mortgage company any deficit on your behalf. Can I change the names on the title after closing? Changing the names on the title can make the loan become due and payable. The loan is based on the ages of the borrower’s and their life expectancy. Why do I need to get counseling? Counseling is one of the most important consumer protection built into the program. It requires an independent third-party to make sure you understand the program, and review alternative options, before you apply for a reverse mortgage. You can seek counseling from a local HUD approved counseling agency, or a national counseling agency, such as AARP (800-209-8085) or National Foundation for Credit Counseling (866-698-6322). Counseling is required for all reverse mortgages and may be conducted face to face or by telephone. By law, a counselor must review (1) options, other than a reverse mortgage, that are available to the prospective borrower, including housing, social services, health and financial alternatives; (2) other home equity conversion options that are or may become available to the prospective borrower, such as property tax deferral programs; (3) the financial implications of entering into a reverse mortgage; and (4) the tax consequences affecting the prospective borrower’s eligibility under state or federal programs and the impact on the estate or his or her heirs. Getting Your Information Together: Contact Lyn. By gathering information from you, it can be determined how much home equity is available to you. I can personally answer your questions and go over details. I can also provide further information. Counseling: HUD requires you to discuss the program in a free, informal session with a HUD/FHA certified Reverse Mortgage counselor. We can help you find a counselor in your area. This can be done face to face or with a telephone call. · A clear copy of your Social Security Card or something with your SS number such as a Medicare card or any official document that lists your Social Security number. · Original Counseling Certificate, we can help find a counselor in your area. The application cannot be submitted without the original counseling certificate. · A copy of your Homeowners Insurance Policy – (the Declaration Page). · A copy of your recent Mortgage Statement(s). · If there is a deceased spouse on the title, please provide a copy of the Death Certificate. · Signed original Ownership Interest Certification (if applicable). · If you live in a condo, we will need the name and number of the management company so we can put the mortgage clause on the policy. · For a Planned Urban Development (PUD), we will need a copy of the owner’s policy. Processing: Your loan assistant will work with a processing specialist and title company to obtain the necessary appraisal, title, credit report and mortgage payoff information (if one exists on your property). The processor may contact you during processing and underwriting to obtain additional information or clarification. The underwriting department will provide us with initial approval and conditions. The Process for getting a Reverse Mortgage After the underwriting conditions have been cleared, the file will be cleared to close. There is a three day Right of Rescission that begins the day after your loan closes. This gives you the opportunity to further review your documents. Saturdays are included in the Right of Rescission period. Closing: Upon underwriting approval and receipt of the closing number from the title company, you will be contacted to schedule the closing time and to determine how you wish to receive the proceeds of your loan. Payments may be made to you as a Lump Sum Payment, Line of Credit, Tenure or Term Plan or any combination of these options. In most states the closing can be done in your home. Funding Date: Four (4) business days after the signing of our closing documents (Saturdays included) your loan will be funded. Depending on the title company, funds can either be wired to your account or a check will be sent to you overnight. Loan Servicing: Approximately 30 days after your closing date the lender will provide you with a Welcome Package. Information included in this package will discuss methods to obtain funds from a line of credit and any repair administration. Repayment: No payment is due as long as you or the co-borrower lives in the home. · Pay off your existing mortgage. You will pay off your first mortgage and completely eliminate the need to make monthly mortgage payments, which increases your monthly income. · Pay off existing debts. You can pay off any debt from credit cards, car loan, or even a home equity loan. · Add to your monthly income. You can take the money from a reverse mortgage’s a monthly payment to supplement your existing income, or choose to take it as a lump sum or a line of credit. · Paying for home maintenance or repair. Use the money to maintain or make improvements to your home which may also increase the value of your home. · Providing funds for long term car insurance, medical bills or prescription drugs. · Helping family members. You can use some of your funds to help with college tuition, help a child buy a home, or just give gifts to those you care about. · Take a trip, play at your hobbies, buy a vacation home. Afford the special things you have always dreamed of doing. As the son or daughter of a senior age 62 or older you should understand the facts about reverse mortgages to determine if this is a good choice for your parents. Many seniors are in a position to let the equity in their home pay them back now and significantly improve their quality of life. Get funds without moving A reverse mortgage can help your parent(s) create a new source of tax free money without having to sell their home. They can live in their home for as long as they would like. Title stays in their name Your parents retain full title to their home and have no risk of losing it to the lender. No matter what happens to the housing market, they can never owe more than the value of their home when it is sold. Independence A reverse mortgage allows seniors to tap into the money they’ve earned from the home equity, and avoid having to depend on relatives for financial assistance. They have earned financial independence. Insured The HECM reverse mortgages are government insured loans which have safeguards built in to protect seniors. To date over 150,000 Americans have enjoyed the benefits derived from a reverse mortgage. Repayment Options The loan becomes due to the lender when the last remaining person on the deed is no longer living in the home. You, as the heir, have the option of selling the home to repay the loan or taking out a traditional mortgage and keeping it. If the balance due on the loan is more than what the house sells for, no one has to pay the difference. This is where the MIP comes in. If the home sells for more than the loan balance, the extra money goes to the estate.